Have you ever dreamed of having your own personal robot? Boston Dynamic, one of the highest profile robot companies, is working to make that dream a reality. At the TechCrunch robotics conference, they unveiled some of their coolest upcoming creations. 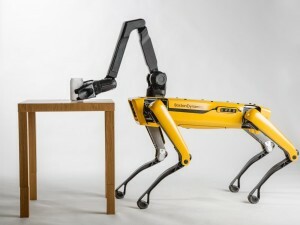 One robot that they revealed was the quadrupedal (four-legged) SpotMini, which is expected to go on sale in 2019. The SpotMini was immediately a favorite because of its cute dog-like appearance and fascinating features. Along with inheriting all the traits of the Spot robot, it can pick up and handle objects. Additionally, it has better perception sensors which enable its navigation to be top-notch. If you drive it manually along an area, it will permanently remember the terrain by building its own map. It’s motion planning software does this by figuring out where the most challenging obstacles and safest places are while using motion control. However, the robot is designed to be a mini version of Spot, which is mainly used on rough terrain. “The SpotMini robots could be useful for security patrols or for helping construction companies keep tabs on what’s happening at building sites,” Raibert explained. I guess that you won’t be having dinner with this robot anytime soon. Fortunately, they hope to make it more suitable for homes and offices in upcoming years. To end his unveiling, Raibert said that “in the long run, robots could be more important than the internet”. They mean that while the world wide web lets you get a sense of everything in the world, the robots allow you to actually manipulate it.